Although Airbus is the most involved of the two civil aerospace giants in developing electric aircraft, it was not the first in the space. That honour goes to Boeing, which started its foray into electric aircraft propulsion in 2012 with a project called SUGARVolt (SUGAR – Subsonic Ultra-Green Aircraft Research). SUGARVolt is in fact a hybrid concept, with dual turbine engines running on conventional jet fuel for take-off and then switching to electrical power at cruise altitude. To account for the reduced thrust in electric mode, the design incorporates features to enhance flight efficiency: a braced, high-aspect wing (mounted atop the fuselage) with a wide span and a narrow, turbulence-reducing width, designed to fold at the tips to allow the aircraft access to standard gates at airports. Intended for first flight in the mid-2030s, SUGARVolt is currently on a hiatus, with Boeing now throwing its weight behind a third-party project. The company announced in April this year that it was investing, through a new venture capital arm called HorizonX, in a Washington State-based company called Zunum that was developing a range of regional hybrid-electric aircraft, with capacities for 10-50 passengers and ranges of 700-1,000 miles (1,100-1,600km). Also investing in Zunum is a subsidiary of the US short-haul budget airline JetBlue Airways. Zunum aims to fly its aircraft between neglected small airports. “The shift to large aircraft and long ranges driven by gas turbines has concentrated almost all air traffic to just 2 per cent of our airports, creating a massive transport gap over regional distances. As a result, door-to-door times for most journeys are no better than they were 50 years ago,” said Zunum chief executive Ashish Kumar. Like Airbus, Kumar regards electric propulsion as the key to changing this, used on take-off and landing to greatly reduce engine noise and access airports nearer city centres without affecting air quality or disturbing residents. In hybrid mode, the engine – still likely to be a gas turbine – would kick in to extend range in cruising flight. The company says these aircraft, which have been in development for three years in partnership with the Center for Power Optimisation of Electro-Thermal Systems at the University of Illinois, will fly first in around 2020, and over a typical route will produce 80 per cent less carbon emissions than a typical airliner of this class. On routes such as Boston to Washington DC, door-to-door journey times could halve, with fares dropping by 40-80 per cent. 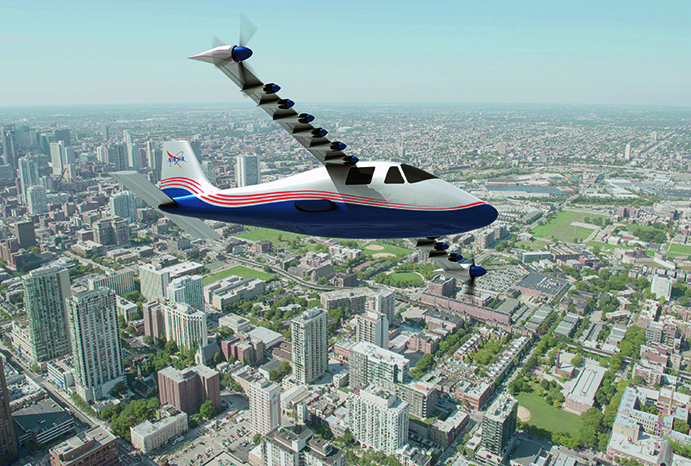 NASA too is active in electric aircraft, using its X-plane designation for the first time in a decade to name its research aircraft, the X-57 “Maxwell”. X-planes became known for research into trans-sonic flight, and included the legendary rocket-powered Bell X-1, which, in 1947, became the first aircraft to break the sound barrier, and the X-15, which flew so high in the 1960s that its pilots were awarded astronaut wings. The X-57 is a very different aircraft, and markedly unlike the sleekly integrated visions of Airbus’s electric airliner concepts, but it further illustrates the principle that electric motors are light and cheap enough to be used in abundance. Purely battery powered and based on an Italian-designed twin piston-engine light aircraft, the Tecnam P2006T, the Maxwell’s high-aspect wing (specifically designed, and long and skinny like the SUGARVolt’s) packs on 14 motors: 12 in the middle for use on take-off and landing, and two larger ones, at each end, for cruising flight. The thinking is that distributing power across multiple motors will cut the energy needed to accelerate the aircraft to 175mph and maintain that speed at cruise to a fifth of levels seen with conventional small aircraft and, of course, with much less noise. Whether the Maxwell will become as legendary as those early X-planes is unclear, but it may have an equal — although very different – influence on future flight. A European project, HY4, takes a different approach to powering electric flight. A four-passenger light aircraft developed by Germany’s DLR aerospace research organisation, HY4 has an 80kW electric motor powered by a hydrogen fuel cell, hybridised with a lithium-ion battery to cover peak power loads. The aircraft was originally developed as a battery-powered plane by Slovenia’s Pipistrel, in which form it won NASA’s Green Flight Challenge three times. DLR converted it to fuel-cell power with onboard high-pressure hydrogen storage, with which it first flew, for 15 minutes, at Stuttgart in September 2016. 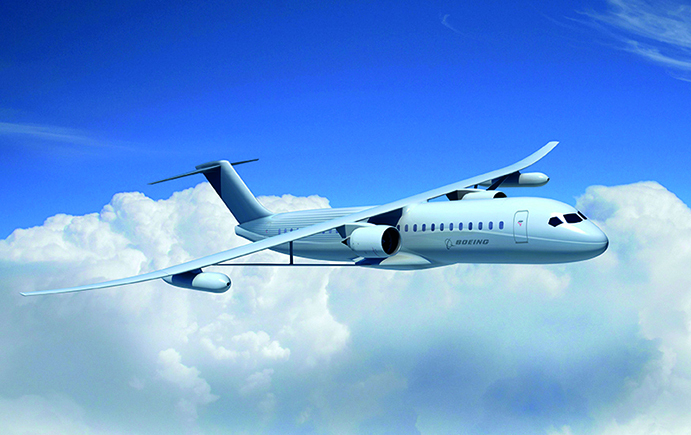 Boeing first demonstrated a hydrogen fuel cell powered electric airplane in 2008. This was the first time a manned airplane had been powered by fuel cells. See the below link for more info.